Nano-sized cables made with titanium dioxide (TiO2)-coated carbon nanotubes could hold the key to developing new high-capacity batteries, report chemists in Germany and China. Lithium-ion batteries are in great demand for applications from laptops to hybrid cars - but the list of requirements is long. They need to be lightweight, cheap and environmentally friendly, but also store enormous charge. As lithium-ion batteries are charged, large amounts of lithium ions are held in the anode, which is typically made from graphite. When the battery is used, these ions migrate to the cathode, sending electrons through the circuit. However, graphite has a fairly low storage capacity and release rate, so finding alternatives is key to making batteries that last longer and produce more power. 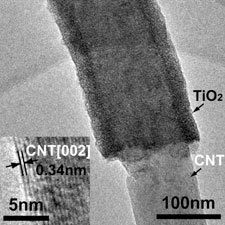 Carbon nanotubes and TiO2 have both been investigated for use as electrodes, but have been deemed impractical until now. 'Titanium dioxide on its own is totally unsuitable for electrodes,' says Joachim Maier of the Max Planck Institute for Solid State Research in Stuttgart, Germany, who collaborated on the research. 'Although it can hold lithium ions effectively, they are slow to diffuse through the structure - and it can take years to fill a millimetre-thick crystal. However, if the TiO2 is only 10nm thick, it is filled in milliseconds,' he says. With this in mind, Maier worked with colleagues at the Beijing National Laboratory for Molecular Sciences in China to coat carbon nanotubes with a nanoporous layer of TiO2. The result is a crystalline solid made up from 'coaxial cables' that are perfect for trapping lithium ions. The nanotubes form a highly conductive core and act as fast-track pathways for electron transfer in the structure, making the electrodes highly conductive. 'Because the two compounds have interfacial contact, they form a symbiotic relationship that boosts their storage ability even further,' Maier told Chemistry World. When combined, the storage capacity of TiO2 is four times higher than usual and the nanotubes hold three times as many ions. Unlike some other compounds that can fracture when repeatedly charged and discharged, the nanocables appeared reliable, showing almost no capacity loss after one hundred cycles. Since the material is simple to produce and far cheaper than electrodes that are based on rare metals, the team are hoping that it can be more widely applied - perhaps for other energy storage devices such as supercapacitors.